All of our footwear is custom assembled by our cobbler. We do not sell any footwear "off the shelf," since everyones foot has a slightly different measurement. Our footwear is 100% custom made, specifically for your foot & leg. We trust our approach to footwear, (although it may be the old way, which insures a better fit, and a source of pride when you show off your custom, cobbler fitted shoes and boots. to take his own measurements of foot, leg, ankle, etc. (Please use the chart below for all measurements). Our cobbler will work from your measurements. Our footwear will be made left & right, unless customer specifically asks for straight last construction. All leather goods are vegetable tanned. Take care of your leather products. Leather care items are available. (Click here). The main difference between the two is the side seam shape & location on the uppers. Accurately styled shoes from the late 17th Century to the mid 18th Century, right down to the smaller buckle, high heel, and square toe. A lot of research has been done for these shoes, using pictures from artifacts discovered on the shipwreck Whydah, one of the Phips ships, and several museum samples in Europe. These shoes are appropriate for European and Colonial civilians, soldiers, pirates, etc. 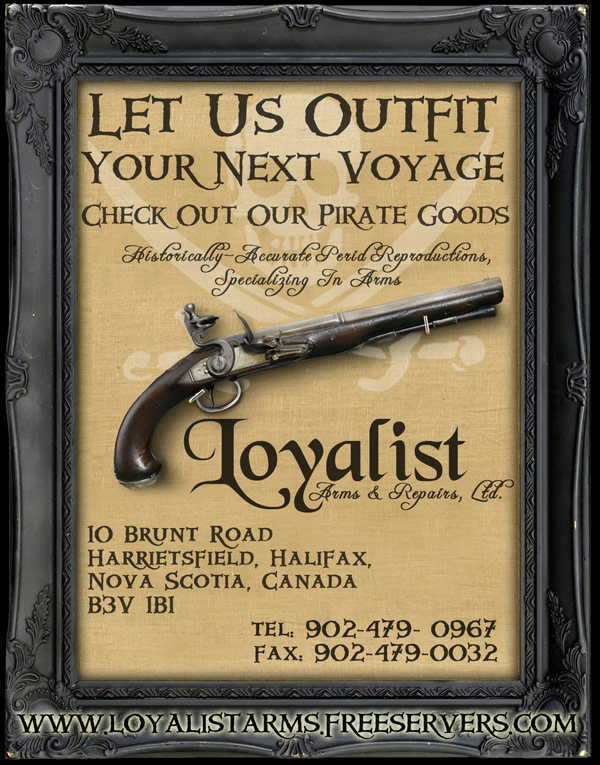 They are custom made just like our Musketeer / Buccaneer boots. The heels are nailed and pegged. Available in black or tan leather, rough or smooth out, and in sizes up to size 13. The early style will fit the 1680's-1720 period, and the later style will fit from about the 1710's-1740's period. By lowering the heel and widening the latchets, we can date the later style shoe to about 1760's or later. Please note: All shoes made prior to the mid 19th Century were made individually by cobblers for different clients, styles varied greatly , and were influenced by economics, clients taste, ethnic background, etc. There was no set pattern of shoe from any period, only general similarities. Loyalist Arms would like to thank all of the many customers who have enthusiastically contributed pictures, measurements, research materials, and suggestions to assist us in developing these shoes. It's customers like you who help us do our best. Special thanks to the contributing pirate reenactors on this project. Fair winds to ye Brethern. * When inquiring or ordering these shoes, please refer to them simply as early or late style to avoid any confusion. Custom made Brogans for Civil War Period until the late 19th Century period. Steel heel plate and leather thong / lace included.